Emily graduated with a Joint Honours in PE, Sports Science & Recreation Management from Loughborough University, UK in 1998. After working in Sports Management and Technology in London for 3 years, she moved to Dunedin, New Zealand to study Physiotherapy at The University of Otago. Emily graduated top of her class and with Distinction in 2003. Emily emigrated to Australia in 2004 where she completed rotations and one year as the Senior ICU/Cardiac Rehab Physiotherapist on the Central Coast before taking the position of Senior Physiotherapist in the infamous ‘Kings Cross ER’ at St Vincent’s Hospital, Sydney. Emily went on to complete her Masters Degree in Sports Physiotherapy in 2014 and was awarded the title ‘APA Sports Physiotherapist’. Emily has worked across a number of sports including Cricket, Netball, Hockey (Field and Indoor), AFL, Rugby, Swimming and Wheelchair Tennis. 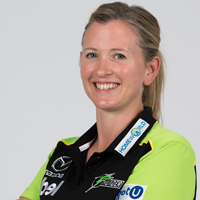 Emily has traveled both nationally and internationally with the WBBL Sydney Thunder Women’s Cricket Team (WBBL Champions 2015/16), Cricket NSW Female Pathway, the Netball World Cup, the Australian Women’s Indoor Hockey Team (World Cup and European Tour), NSW Hockey and NSW Netball. She will also be working with Hockey at the 2018 Commonwealth Games. Emily has also completed advanced training in the treatment and management of concussion, and has teamed up with Headsmart to offer baseline and post-concussion testing. In Many sports, baseline testing is now mandatory at elite level and it is now becoming more necessary for community sports to come on board. Impacts happen in all levels of sports participation from community to elite (as well as in road accidents, trips and falls and other social situations). Emily prides herself on her professional approach to every patient and every treatment. She firmly believes in a holistic individualised approach to treating the ‘inner athlete’ in everyone. She applies her enthusiasm and experience to all age groups and abilities, to promote a greater sense of health and well-being.